Taking the Vesalian anatomical revolution as its point of departure, this volume charts the apparent rise and fall of anatomy studies within universities in sixteenth-century Spain, focussing particularly on primary sources from 1550 to 1600. In doing so, it both clarifies the Spanish contribution to the field of anatomy and disentangles the distorted political and historiographical viewpoints emerging from previous research. Studies of early modern Iberian science have only been carried out coherently and collaboratively in the last few decades, even though fierce debates on the subject have dominated Spanish historiography for more than two centuries. In the field of anatomy studies, many uninformed and biased readings of archival sources have resulted in a very confused picture of the practice of dissection and the teaching of anatomy in the Iberian Peninsula, in which the highly complex conditions of anatomical research within Spain’s national context are often oversimplified. The new empirical evidence that this book brings to light suggests a far more multifaceted narrative of Iberian Renaissance anatomy than has been presented to date. '"Anatomy and Anatomists in Early Modern Spain is a rich resource on two levels. It provides a comprehensive, English-language account of Spanish anatomy in the sixteenth century, especially detailed with respect to the university setting. The numerous publications produced in that period, primarily in Spanish, are carefully described in detail as are the myriad of figures who played a part in the development of anatomy. 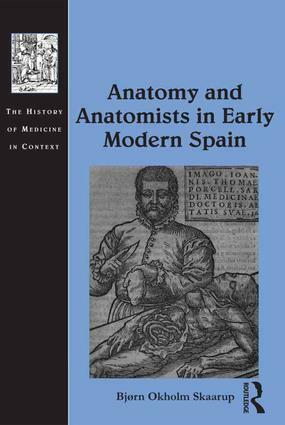 The secondary literature surrounding these topics is also carefully evaluated, and anyone seeking an up-to-date history of anatomy in Spain will welcome this book." "This work is a useful and well researched contribution towards making available the flourishing history of medicine in Spain…"
BjÃ¸rn Okholm Skaarup received his PhD from the European University Institute, Florence in 2009 and conducted post-doctoral research at the Warburg Institute, UK, and Columbia University, USA. He is also an artist whose work has been exhibited internationally. An interest in medicine is one of the constants that re-occurs throughout history. From the earliest times, man has sought ways to combat the myriad of diseases and ailments that afflict the human body, resulting in a number of evolving and often competing philosophies and practices whose repercussions spread far beyond the strictly medical sphere. For more than a decade The History of Medicine in Context series has provided a unique platform for the publication of research pertaining to the study of medicine from broad social, cultural, political, religious and intellectual perspectives. Offering cutting-edge scholarship on a range of medical subjects that cross chronological, geographical and disciplinary boundaries, the series consistently challenges received views about medical history and shows how medicine has had a much more pronounced effect on western society than is often acknowledged. As medical knowledge progresses, throwing up new challenges and moral dilemmas, The History of Medicine in Context series offers the opportunity to evaluate the shifting role and practice of medicine from the long perspective, not only providing a better understanding of the past, but often an intriguing perspective on the present.